It's getting cold now, so I have broken out Louies jumpers. Short haired Chihuahuas get cold very easily. Awwww. Does he like wearing one? Oh my yes. He loves dressing up. As we try to put any clothing on him, he is trying to ram his head in any hole he can find. He gets so excited and thinks it's a game. 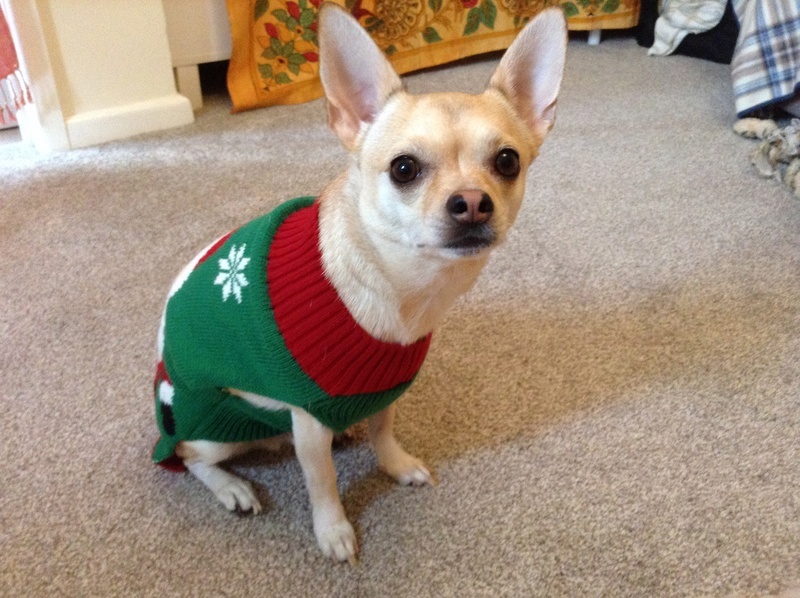 He has three jumpers that I tried on him yesterday to check they still fit and he thought it great fun. The girls put doggy hats on him as well. I've never tried him with boots though. But they do advise that in the snow you put boots on them. Short haired Chi's get very cold very quickly, but I don't think Louie would take to those. When he was tiny, Mark, Sarah's ex bought him a fur lined flight bomber jacket with the hat as well. It was brilliant. He doesn't wear hats out of doors though, they are just for fun when playing with him. One of my dogs had a rainproof coat and a fleecy coat when she got to 17 because she started to feel the cold but the rest never needed them. They all had thick coats of their own. She wasn't keen on wearing them but I suppose that's because she wasn't used to it. I never had to put coats or such on my Yorkies either, and yet they carry less fat than a Chi. Now they both couldn't care less about what the weather was like. They just loved getting out and about and were very hardy creatures. But then you see, the Chi is not like any other dog. For a start it's common ultimate ancester isn't the wolf as dogs are. Not that they know what it's ultimate ancester was. There are many theories to this but none proven as yet. Some say it was a Fennec Fox but that's impossible because foxes can't mate with the dog family. Although there are the occasional type of fox that can mate with a dog but the offspring are always sterile, like a mule is. So although they aren't ultimately from a wolf whatever they are they are probably from some sort of Jackal or something we would call a fox like animal but one that can breed with a normal dog because today people do breed chi's with other small type dogs. Maybe their ultimate ancester no longer exists. They can be traced back as far as ancient Egypt and also ancient China and they have alway been a smaller creature and not as the small dog we have that have been bred to be smaller and smaller. Although of course in these modern times they are breeding the Chi deliberately smaller now, even than they were 50 years ago. This is why they can now be from tiny teacup size up to 15 inches at the shoulder. Although I think the show dogs can't be more than a max of 8 inches at the shoulder. I would suspect that 15 inches is their very original size going way back. Louie is between 10 and 11 inches depending on how still he stands when I measure him. He is perfectly formed as a Chi with no defects but he would be too tall to show. The other difference between dogs and chi's is that the natural way for a dog to make a comfortable bed is to walk around in a circle then plomp themselves down. This comes from their ancesters, the wolf, walking around in a circle to flatten grasses to make comfortable bed. Whereas with Chi's they burrow. In other words, they make a den. They burrow under blankets and covers and feel more secure when they are completely covered up to sleep. This also is a foxes character. In this day and age you would think that with genetics they would be able to now know how the Chi developed and where from. Although they are named after a town in Mexico they do believe that originally they may have come from China. So you can see how and why the Chi, although we think of them, and treat them, as dogs, have totally different needs and wants to other dogs. It's almost like the difference between a cat and a dog really. Oh my God! I really did laugh out loud at that. Thank goodness I wasn't sipping my tea or I would have choked. My girls like dressing their dogs in a xmas outfit and they do also have a warm coat for the winter walks and they love it. I think so too. I think our Aimee bought it for him last year. 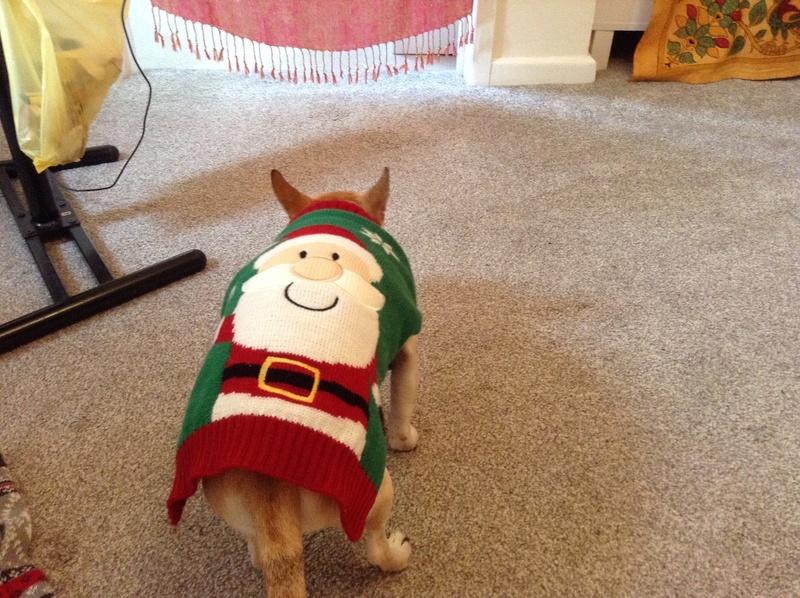 They often buy him jumpers so I sometimes get muddled as to who bought him what. For some reason Chihuahuas really do enjoy being bundled up. Thanks Keri. He does, doesn't he.